shockwave Therapy vancouver - What is Shockwave? Shockwave is an innovative, non-invasive treatment involving high frequency, short duration, bursts of high-energy pulses that are transmitted into injured tissues. These high intensity pulses of mechanical energy aggravate the injured tissues (muscles, tendons, ligaments, bone, etc.) at a cellular level, which stimulates a healing response. Furthermore, shockwave therapy stimulates cells in your body called osteoblasts and fibroblasts. Osteoblasts are responsible for bone healing and creating new bone tissue, while fibroblasts are responsible for healing connective tissues such as ligaments and tendons. ​Ultimately, this treatment strategy accelerates the healing process in the body by stimulating the metabolism and enhancing blood circulation to repair damaged tissue. The literature has shown this technique to be very successful! Depending on the sensitivity of the injury, some discomfort may result during treatment. If pain is experienced your physiotherapist can adjust the intensity of the therapy, to promote analgesia at the start of your treatment. Granville Physio has also purchased the V Actor applicator which can be provided before the treatment to release the muscles in a gentle way and after to remove waste products, thus reducing your pain during and after your treatment sessions. Many clients experience a decrease or complete absence of pain immediately after treatment. Bruising, swelling, and on rare occasions, skin breakdown may occur. There may be some soreness 1-2 hours afterwards due to an inflammatory response of the body to the shockwave. This is normal and is your body’s way of healing itself and regenerating the targeted tissue. Who should not use shockwave therapy? 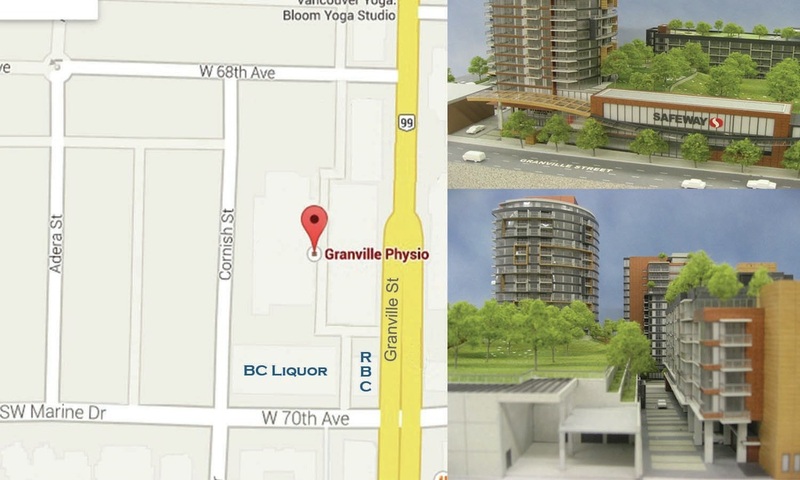 Located behind the Safeway at the intersection of Granville Street and 70th Street, our brand new clinic offers ample free parking and easy access from southbound lanes on Granville or off of 70th between the Royal Bank and BC Liqour store. We provide shockwave therapy for Vancouver and Richmond, including the Dunbar, Kerrisdale, Oakridge, and Marpole neighborhoods.